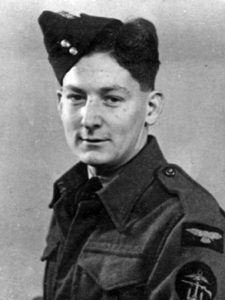 I joined the RAF in 1941, trained as an armourer and served in Bomber Command and Operational Training Command (OTU). Then, in June 1943, while I was with 24 OTU at RAF Honeybourne, a notice appeared asking for volunteers for an RAF Servicing Commando Unit. These units had been formed at the instigation of Lord Louis Mountbatten in 1942. I was posted to Zeals in Wiltshire and joined 3210 Servicing Commando. The unit consisted of 150 tradesmen with our own officers and transport. At Zeals we did military training, learnt to drive lorries and ended up driving to Inverary for a two weeks’ combined operations course. After Zeals we were split up into flights and sent to various RAF stations in England, helping RAF units with their servicing of planes. Also we had refresher courses with training command. The unit came together again in May 1944 at Bognor Regis and later moved to a transit camp on Salisbury Plain, which we left on 5 June for another transit camp at Fareham, leaving there early in the morning on 6 June. We embarked with our lorries at 09.00 and sailed later that day. We arrived off the French coast about 04.30, and the next day landed about 09.30 at Graye-sur-Mer. We had become separated from the rest of our unit, and spent the night of 7-8 June in a field just off the beaches. We found the rest of the unit on 8 June; they were already at B3 Airstrip at St Croix-sur-Mer. On 10 June Wing-Commander Johnnie Johnson landed with 36 Spitfires of No 144 Canadian Wing, so B3 was the first airstrip to become operational in France. We were at B3 until 15 June, when we moved to B4 Beny-sur-Mer. We also worked at airstrips at St Gabriel, Lantheuil, Martragny and Ellon. Together with several others I also spent ten days working at A1 St Pierre-du-Monde in the American sector, salvaging crashed Spitfires, and several days working on the glider landing ground near Benouville. Apart from re-fuelling and re-arming Spitfires, Hurricanes, Mustangs, Thunderbolts and Typhoons, during the early days of the invasion we fetched our food packs, aviation fuel (in jerry cans), ammunition and rockets for the Typhoons from the beach area. On most of the airstrips we were shelled, mainly at night, but not a lot of damage was caused. At B4 Beny-sur-Mer we were quite shocked when, as we were fitting rockets to Typhoons, we were fired on! Unknown to us an underground German radar station had escaped discovery during the Canadian advance. The Royal Marine Commandos were called up and soon dealt with the problem. At the end of July, 3210 Servicing Commando, together with 3209, returned to the UK, much to our surprise. We discovered later in 1944 the reason: we were to be included in the invasion force for Malaya. However, as this was not necessary, 3210 finished up as part of a peace-keeping force in Java until 1946.